The tables present SSI data by eligibility category (aged, blind, and disabled) and age. State data on the number of recipients and amount of payments are shown in Tables 1 and 2, respectively. SSI recipients who also receive Social Security (Old-Age, Survivors, and Disability Insurance) benefits are shown in Table 1 and in Table 3, which presents data at the county level. For the applicable states, Table 4 shows state-level data on persons receiving federally administered state supplementation payments by the recipient's living arrangement. 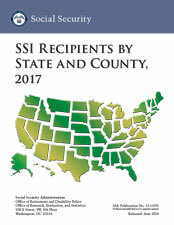 Some tables from the discontinued report State Assistance Programs for SSI Recipients are incorporated into this report beginning with the 2012 edition. Cherice Jefferies in the Office of Statistical Analysis and Support programmed and compiled the data for this report. Staff of the Office of Information Resources edited the report and prepared it for web publication.